I’ve had a stock pile of beets left in the fridge, from my garden, for quite some time, along with some cabbage that needed using. I realized it’s been some time since I made borscht, so, voila! The great thing about borscht is that you can vary the vegetable ingredients to use up whatever you have in the fridge. Got some turnip? Throw it in. Got some parsnips? Leeks? Throw them in too! The mainstays are simply the beets and cabbage. You can even add some beef or beans if you want the extra protein. This is one of those soups that’s even better the next day, so you can even make it ahead if needed. 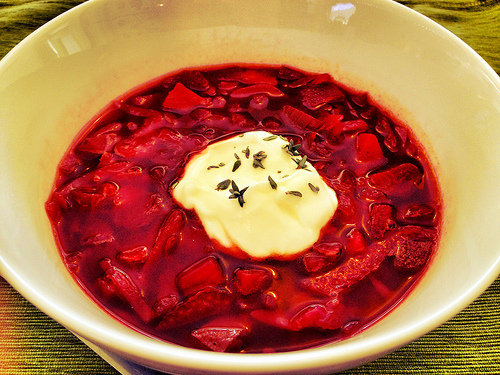 Finally, borscht also freezes nicely so pack up the leftovers for some future work or lazy Saturday lunches. In large saucepan, melt butter over medium heat. Add beets, leeks, carrots, garlic, onion, turnip, celery, potato and bay leaves; cook, stirring occasionally, for 20 minutes. Stir in broth and tomato paste. Bring to simmer and simmer gently for 10 minutes. Stir in cabbage; cook for another 5 to 10 minutes, until cabbage is softened. Season with vinegar, sugar, and salt and pepper to taste, adding more vinegar and sugar if needed. There should be a nice sweet and sour balance. Discard bay leaves. Place dollop of sour cream and sprinkle of chives on each serving. Great colour…now if I only liked beets!